MacBook Pro Core 2 Duo Benchmarks Are In: How Much Faster Are They? 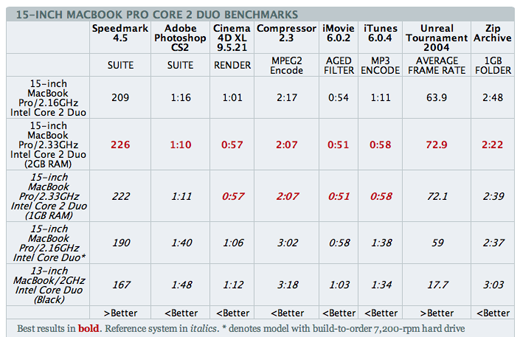 Are the updated Core 2 Duo MacBook Pros really 39% faster than their Core Duo predecessors? MacWorld takes a look to see how much the speed boost and additional L2 cache really helped. Scoring times in photoshop a full 24 seconds faster in Photoshop, and 45 seconds faster in Compressor, the Core 2 Duo models quite speedy, but not 39% faster. In fact, in some tests they were only marginally faster (a time of 1:06 down to 1:01, time of 0:58 to 0:54, and frame rate of 59 to 63.9). In tasks that were more processor oriented, the Core 2 Duo's speed improvements were "substantial". In disk or graphics intensive tasks, were quite a bit smaller. Just be aware what kind of performance gains you're getting when you upgrade to a Core 2 Duo MacBook Pro.